the business world for over 30 years. 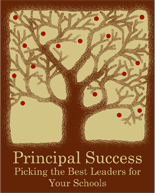 Who benefits from careful principal selection? and the Community as a whole! How can you tell if they’ve got it? requirements, using data-based decisions instead of “hunches”. means better principals & better schools. better education for your students.